Question: What are the three most important factors in purchasing real estate? This old and often-used adage is meant to imply that location completely dominates all other factors when it comes to real estate. In a similar argument, the three most important factors to consider for using primitive types in Java are performance, performance, performance. There are two differences between the argument for real estate and the argument for primitives. First, with real estate, location dominates in almost all situations, but the performance gains from using primitive types can vary greatly from one kind of application to another. Second, with real estate, there are other factors to consider even though they are usually minor in comparison to location. With primitive types, there is only one reason to use them — performance; and then only if the application is the kind that can benefit from their use. Primitives offer little value to most business-related and Internet applications that use a client-server programming model with a database on the backend. But the performance of applications that are dominated by numerical calculations can benefit greatly from the use of primitives. Software performance is usually measured in terms of time and space. Time can be actual running time, such as 3.7 minutes, or order of growth based on size of input, such as O(n2). Similar measures exist for space performance, which is often expressed in terms of main memory usage but can also extend to disk usage. Improving performance usually involves a time-space tradeoff in that changes to improve time often have a detrimental effect on space, and vice versa. An order-of-growth measurement is dependent on the algorithm, and switching from wrapper classes to primitives won’t change the result. But when it comes to actual time and space performance, the use of primitives instead of wrapper classes offers improvements in both time and space simultaneously. As you probably already know if you are reading this article, Java has a dual-type system, usually referred to as primitive types and object types, often abbreviated simply as primitives and objects. There are eight primitive types predefined in Java, and their names are reserved keywords. Commonly used examples include int, double, and boolean. Essentially all other types in Java, including all user-defined types, are object types. (I say "essentially" because array types are a bit of a hybrid, but they are much more like object types than primitive types.) For each primitive type there is a corresponding wrapper class that is an object type; examples include Integer for int, Double for double, and Boolean for boolean. Primitive types are value based, but object types are reference based, and therein lies both the power and the source of controversy of primitive types. To illustrate the difference, consider the two declarations below. The first declaration uses a primitive type and the second uses a wrapper class. but the underlying semantics don't change. Autoboxing simplifies the use of wrapper classes and reduces the amount of code a programmer has to write, but it doesn't change anything at runtime. The difference between the primitive n1 and the wrapper object n2 is illustrated by the diagram in Figure 1. The variable n1 holds an integer value, but the variable n2 contains a reference to an object, and it is the object that holds the integer value. In addition, the object referenced by n2 also contains a reference to the class object Double. Before I try to convince you of the need for primitive types, I should acknowledge that many people won't agree with me. Sherman Alpert in "Primitive types considered harmful" argues that primitives are harmful because they mix "procedural semantics into an otherwise uniform object-oriented model. Primitives are not first-class objects, yet they exist in a language that involves, primarily, first-class objects." Primitives and objects (in the form of wrapper classes) provide two ways of handling logically similar types, but they have very different underlying semantics. For example, how should two instances be compared for equality? For primitive types, one uses the == operator, but for objects the preferred choice is to call the equals() method, which isn't an option for primitives. Similarly, different semantics exist when assigning values or passing parameters. Even the default values are different; e.g., 0 for int versus null for Integer. For more background on this issue, see Eric Bruno's blog post, "A modern primitive discussion," which summarizes some of the pros and cons of primitives. A number of discussions on Stack Overflow also focus on primitives, including "Why do people still use primitive types in Java?" and "Is there a reason to always use Objects instead of primitives?." Programmers Stack Exchange hosts a similar discussion entitled "When to use primitive vs class in Java?". A double in Java always occupies 64 bits in memory, but the size of a reference depends on the Java virtual machine (JVM). My computer runs the 64-bit version of Windows 7 and a 64-bit JVM, and therefore a reference on my computer occupies 64 bits. Based on the diagram in Figure 1 I would expect a single double such as n1 to occupy 8 bytes (64 bits), and I would expect a single Double such as n2 to occupy 24 bytes — 8 for the reference to the object, 8 for the double value stored in the object, and 8 for the reference to the class object for Double. Plus, Java uses extra memory to support garbage collection for objects types but not for primitive types. Let's check it out. Using an approach similar to that of Glen McCluskey in "Java primitive types vs. wrappers," the method shown in Listing 1 measures the number of bytes occupied by an n-by-n matrix (two-dimensional array) of double. Modifying the code in Listing 1 with the obvious type changes (not shown), we can also measure the number of bytes occupied by an n-by-n matrix of Double. When I test these two methods on my computer using 1000-by-1000 matrices, I get the results shown in Table 1 below. As illustrated, the version for primitive type double equates to a little more than 8 bytes per entry in the matrix, roughly what I expected. However, the version for object type Double required a little more than 28 bytes per entry in the matrix. Thus, in this case, the memory utilization of Double is more than three times the memory utilization of double, which should not be a surprise to anyone who understands the memory layout illustrated in Figure 1 above. To compare the runtime performances for primitives and objects, we need an algorithm dominated by numerical calculations. For this article I have chosen matrix multiplication, and I compute the time required to multiply two 1000-by-1000 matrices. I coded matrix multiplication for double in a straightforward manner as shown in Listing 2 below. While there may be faster ways to implement matrix multiplication (perhaps using concurrency), that point is not really relevant to this article. All I need is common code in two similar methods, one using the primitive double and one using the wrapper class Double. The code for multiplying two matrices of type Double is exactly like that in Listing 2 with the obvious type changes. I ran the two methods to multiply two 1000-by-1000 matrices on my computer several times and measured the results. The average times are shown in Table 2. 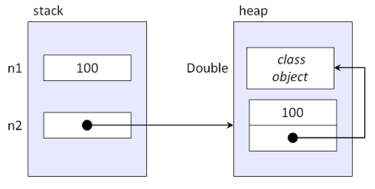 Thus, in this case, the runtime performance of double is more than four times as fast as that of Double. That is simply too much of a difference to ignore. Thus far I've used the single, simple benchmark of matrix multiplication to demonstrate that primitives can yield significantly greater computing performance than objects. To reinforce my claims I'll use a more scientific benchmark. SciMark 2.0 is a Java benchmark for scientific and numerical computing available from the National Institute of Standards and Technology (NIST). I downloaded the source code for this benchmark and created two versions, the original version using primitives and a second version using wrapper classes. For the second version I replaced int with Integer and double with Double to get the full effect of using wrapper classes. Both versions are available in the source code for this article. The SciMark benchmark measures performance of several computational routines and reports a composite score in approximate Mflops (millions of floating point operations per second). Thus, larger numbers are better for this benchmark. Table 3 gives the average composite scores from several runs of each version of this benchmark on my computer. As shown, the runtime performances of the two versions of the SciMark 2.0 benchmark were consistent with the matrix multiplication results above in that the version with primitives was almost five times faster than the version using wrapper classes. Scala is a programming language that runs on the JVM and appears to be gaining in popularity. Scala has a unified type system, meaning that it doesn't distinguish between primitives and objects. According to Erik Osheim in Scala's Numeric type class (Pt. 1), Scala uses primitive types when possible but will use objects if necessary. Similarly, Martin Odersky's description of Scala's Arrays says that "... a Scala array Array[Int] is represented as a Java int, an Array[Double] is represented as a Java double ..."
So does this mean that Scala's unified type system will have runtime performance comparable to Java's primitive types? Let's see.